Red Comet, an Accredited, Self-Paced, Online High School, Launches a Credit Course on Social Problems I. Red Comet’s new online elective course “Social Problems I: World in Crisis” is a direct result of the rising interest in the various conflicts occurring throughout the world. This aspect of social sciences studies people in relation to the world, communities and culture – and analyses the factors that contribute to conflicts, struggles and issues that sometimes affect the entire world. 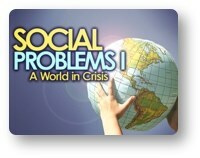 This course examines a number of current social problems that affect the world. Students learn more about the challenges facing societies and the relationships between societies, governments, and individuals in different geographic areas. Each unit focuses on a particular area of social concern, often with a global view, and examines possible solutions at both a structural and individual level. Students learn more about how social problems affect their own lives and the ways in which they can make a difference in the social problems that exist in their lives, communities, and the world at large. Red Comet offers a complete online program that is both rigorous and engaging. Red Comet is approved by the Office of Superintendent of Public Instruction (OSPI) in Washington State as a “Multi-District Online Course Provider” and as a “Multi-District Online School Program Provider”. Red Comet’s online program excels not only in the breadth of its offering but also has received the best ratings for student satisfaction in Washington State. Red Comet’s online learning is engaging and presents even the most challenging topics in a way that students can understand. Students taking Red Comet's online high school classes are challenged using a variety of learning techniques which makes learning interesting while keeping them motivated to complete their courses within the allotted schedule. Red Comet is used throughout the United States. Core subjects covered include Mathematics, Language Arts, Science and Social Studies, but there are also many different electives available as well. For students who need high school classes that they cannot make in person, students searching for Advanced Placement classes and home school high school students, Red Comet is a very good choice. It is also a viable option for students who need credit recovery.